Happy New Year and all that jazz. Things are getting back to normal here with Harper growing like a weed, Jane transitioning into true toddlerhood (buddha help us) and the holidays over. 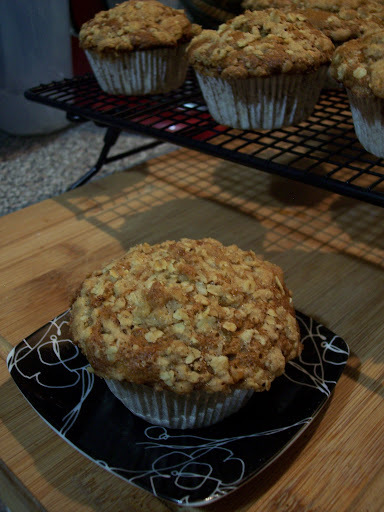 In the spirit of new year's resolutions, I'm posting a muffin recipe that sounds like it should be healthy, but is probably far from it :) My new year's resolution was to give up Diet Coke, because of the aspartame, and its going perfectly for me. Of course, instead I want to bake sweets and drink coffee instead. We all need our vices, yeah? Okay, muffin time. PUT AWAY YOUR MIXERS! That's an order. Overmixing is the reason so many muffins fail. Preheat your oven to 200C/400F. You are going to bake at 190C/375F. I'll explain later. Sift flour, baking powder, baking soda, cinnamon and salt together. Beat egg, oil, vanilla, sugar and mashed banana until well combined. Create a well in the flour mixture and pour in your banana mix. Take a spatula and gently fold the dry into the wet ingredients. Just barely. It's okay, desirable, to have some flour visible and not completely wet. Mix the crumble topping. Put oats, sugar, flour and cinnamon in a bowl and stir together. Cut in 2 tbsp of butter like you would to make pastry. My house is cold enough at the moment to just use my hands, but sometimes that makes the butter melt to much and two forks do the job. mash and mix it together until it forms crumbs. Fill a muffin tin (this makes 12) with muffin cases and fill each one about 2/3 full. I use a large cookie scoop. Sprinkle about a tbsp or so of your crumble mix on top. Okay, stick them in the oven. Turn the heat down to 190C/375F after 5 minutes. That burst of hotter air will help the baking powder activate and cause better rise in the muffins (and that light fluffiness you want!). Bake a total 20-25 minutes. Just test them with a skewer and take them out when it comes out clean. Have with a delicious cup of coffee. So tasty.